Drawing from bands like Minus the Bear and Brand New, Instead of Sleeping started back in 2009, with Sweeney, drummer Corey McClain, bassist Tony ?Wolfman? Tortella, and guitarist and keyboardist Woody Wright making up today?s lineup. Every so often, you need to bring new blood into the mix. While some ideas are trusted and true, an infusion of youth can lead to something exciting, mixing fresh thoughts with an established plan of attack. While just of college, the four members of Instead of Sleeping are providing an influx of youth in the western Pennsylvania music scene. 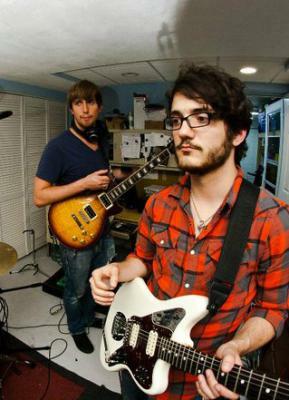 The Pittsburgh-based melodic indie band is playing its first show in downtown Erie at Basement Transmissions Sunday, June 10. According to guitarist and vocalist Shaun Sweeney, it's a performance the band is really looking forward to. "Getting a good venue and starting a good crowd in Erie is very important to us," Sweeney said. "I really hope people can come out and see us play, because we really want to put on the best show we can." Drawing from bands like Minus the Bear and Brand New, Instead of Sleeping started back in 2009, with Sweeney, drummer Corey McClain, bassist Tony "Wolfman" Tortella, and guitarist and keyboardist Woody Wright making up today's lineup. "Woody and I went to the same high school, which is how we met," Sweeney said. "We were working on different projects before this. It started as a side project and started taking precedence over everything else." After playing together, the group started honing their sound into the guitar-driven indie rock it is today, a collaborative effort that shaped the band. In fact, the name didn't come about until a bit of unexpected parental assistance. "Whenever I was initially writing all the music by myself, I was doing it very late at night, when I had some free time," Sweeney said. "It's kind of a lame story, but my mom came down and said 'so this is what you're doing instead of sleeping,' and I just took it." Despite the band's youth, Instead of Sleeping has already released a pair of EPs, as well as a full-length album, touring across the east coast in support of all of them. The band is even working on a follow up album, expected to be released later this year, posting some of the live demos on their website to give listeners a sneak peek at the group's newest material. Of course, Sweeney suggests that to get the true Instead of Sleeping experience, you have to come to see them live. "We like to write music that is fun to play, fun to perform for people, and that people like to see live," Sweeney said. "We kind of try to make every show more of an experience than your typical concert." With their outgoing nature and aim to please, Instead of Sleeping's members are a young group of guys trying to earn their way into the area's hearts (and iPods) and break into the local music scene. An enthusiastic group on the way up, you won't grow tired of Instead of Sleeping.